Since 1920, there have been four generations of Hicks family veterinarians caring for animals in the Rocky Mount area. Hicks Animal Clinic, which was established in 1982, is the only remaining Hicks family owned and operated veterinary practice. Dr. Stuart S. Hicks (Smith) pictured right, graduated from Auburn University Veterinary School in 1976. He met his wife, Dee Dee Cheek, during his last two years of vet school. After graduating, they were married and moved to Lexington, KY. There he worked for Dr. D.L. Proctor, Jr. In the 1970’s, Dr. Proctor was one of the most highly regarded and respected veterinary practitioner and surgeon in the equestrian circuit. Dr. Stuart focused solely on equine medicine for one year and treated top racing Thoroughbreds in the area. He even saw Secretariat’s first yearlings sold at the Keeneland auctions. In late 1977, he practiced for a couple of months at a small animal clinic in Wilmington, NC. In early 1978, he returned to Rocky Mount to practice with his dad. Collectively they split time caring for small animals at Hicks Veterinary Hospital. They also shared on-call duties with Dr. Bob focusing on farm calls and Dr. Stuart focusing on horse calls. Between the two of them, they were able to care for the majority of species in the surrounding area. After his father’s death, in 1982, Dr. Stuart relocated from downtown to Hicks Animal Clinic on Sunset Avenue at what is currently Hammer Chiropractic Center. He remained there until 1990, when he relocated to the current location of 3200 Sunset Avenue. 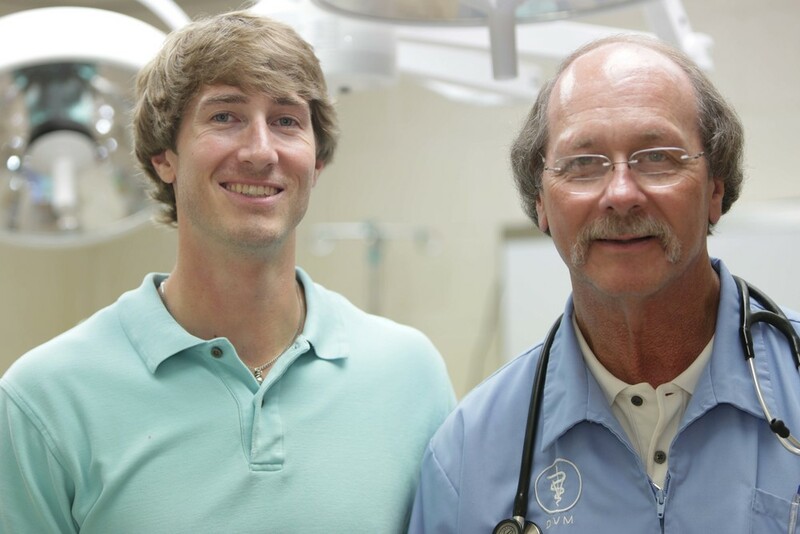 His son, Michael, is the fourth generation of Hicks veterinarians. Dr. Michael S. Hicks, pictured left, graduated from Saint George’s University School of Veterinary Medicine in 2012. St. George’s University is located on Spice Island of Grenada in the West Indies and is fully accredited by the American Veterinary Medical Association. The school affiliates globally with many veterinary programs. Dr. Michael chose to complete his clinical studies at the University of Tennessee. Dr. Michael completed his undergraduate and postgraduate studies at Auburn University earning a BS degree in Animal Science and a Master’s of Agriculture with focus on farm animal nutrition. After graduating, Dr. Michael volunteered with the Integrative Medicine program at UT for a month, exposing himself to acupuncture, massage, and herbal therapy. He then worked at Young-Williams Animal Center, a large spay and neuter animal shelter in Knoxville, for over 5 months while searching for a more stable job. He ultimately accepted an associate position in Johnson City, TN, where he was part of a 10 doctor rotation at a 24-hour small animal practice with 3 locations. About a year after starting, he met Jessica Ratliff. They dated for a short time prior to getting married and remained in Johnson City until late 2015. Dr. Michael’s love of animals has motivated him to seek unique animal experiences. While at Auburn, he volunteered as a shift manager at the Southeastern Raptor Rehabilitation Center for over a year and a half, working with eagles, hawks, and owls. His postgraduate degree involved performing statistical analysis on over 12 years of pig data to determine ways to increase herd productivity. In Grenada, he was involved in mapping and genetic blood testing the endangered Grenadian Tree Boa as well as conservation efforts & egg relocation for the Leatherback Sea Turtle. While at the University of Tennessee, he helped perform veterinary care at The Knoxville Zoo, Ripley’s Aquarium, and Tiger Haven dealing with red pandas, giant land tortoises, stingrays, penguins, and tigers. In January of 2016, Dr. Michael returned home to practice with his dad. He plans to continue the family tradition in Rocky Mount and to carry on his ancestor’s legacy. However, our story really begins with Dr. Lev H. Hicks. He graduated from the United States College of Veterinary Surgeons in Washington, DC in 1917. He was commissioned as Second Lieutenant in the Vet Corps of the US Army on July 20, 1917 and deployed to France in 1918 during World War I. He attended to the cavalry horses and mules used during battle while serving under the meritorious General Lloyd M. Brett. In 1920, he and his family settled in Rocky Mount and founded Hicks Veterinary Hospital. He first practiced near downtown on Tarboro Street by the old Ford dealership, later moving to the familiar location at North Main Street. His dedication to veterinary care was unwavering, often working 7 days a week. He also served many years as city meat inspector. In 1947, he was testifying in Winton, NC on an animal case as an expert witness for the railroad, when he suffered a fatal heart attack. Dr. Lev had 2 sons, both of which were veterinarians. The younger son, Warren H. Hicks (Buddy), graduated in 1943 from Alabama Polytechnic Institute (Auburn University) with a doctor’s degree in veterinary medicine. He went to Washington, DC to work a short time in a small animal hospital and then was called into service during World War II. He was a member of the Army Medical Administrative Corps and was deployed to New York City where he inspected meats for the military. There he met his wife, Carolyn Tatum. After his service, he moved to Opelika, Alabama where the Tatum family owned a car dealership. Buddy began working for the car dealership and ultimately quit practicing veterinary medicine. The elder son, Dr. Robert G. Hicks (Bob), graduated veterinary school from Alabama Polytechnic Institute (Auburn University) in 1943, a different class than Buddy. After graduating, he opened the only veterinary clinic, at the time in Robersonville, NC. There he met and married his wife, Ethel Smith. They moved to Rocky Mount after the passing of Dr. Lev in April 1947, to continue the family practice. Dr. Bob was a friend and benefactor to all creatures, large and small of every description including the infrequent monkey or alligator. He had a two-way radio in his car with a long antenna used to communicate with the hospital during farm calls. It was quite an experience to ride with him on a call. He was well-known for driving an Oldsmobile 98 that could be seen burning tires around turns with the whip antenna lying parallel with the trunk lid. Dr. Bob was a real character, full of energy and who could entertain you with jokes and stories. He worked hard and often. And like his father before him, he passed away from a heart attack in 1982. His sons Bobby and Stuart went on to follow in his footsteps. Dr. Robert F. Hicks (Bobby) graduated in 1973, from Auburn University Veterinary School. He worked his postgraduate year with Dr. Tommy Needham in Wilmington, NC, returning to Rocky Mount, in 1974, to work a year with his dad. His interest in small animal practice steered him to The Animal Medical Center in New York City. He did a 1 year internship and extended for a 2 year medical residency with focus on internal medicine. His last year there, he met his wife, Dr. Ann McGowan, also a veterinarian. After NYC, Dr. Bobby took a year off, before returning to Wilmington, NC as an associate for Dr. Needham. Dr. Bobby and Dr. Ann moved to the Raleigh area in August 1979, where they were married. Dr. Bobby worked at After Hours Emergency Clinic for I year, then as a locum veterinarian for 1.5 years, then had a house call practice for 6 months. In October 1982, after his father’s death, they came to Rocky Mount and located in the old Hicks Veterinary Hospital in downtown on North Main Street. In October 2002, they relocated in the Benvenue Animal Hospital on NC 43. On October 1, 2015, they sold the practice and retired.